Think about that for a while and compare it with the definition of a product. A product is a tangible good, the benefits of which are consumed post-production of the good. It is clear I can’t enjoy the benefits of the MacBook Pro that I am using to write this blog until the MacBook Pro has been manufactured. It is tangible: I can touch it, or taste it even should I be so inclined to lick it. What about software? Where does that fit with this definition? Software is an intangible good, the benefits of which are consumed post-production of the good. It is clear that I cannot enjoy the benefits of Squarespace that I have used to create this website until Squarespace has been designed, coded, compiled, debugged and distributed. What has this got to do with the Routemaster bus? The Routemaster, according to our definitions above, is a product albeit one that has become a design classic, an icon of London, part of the UK plc brand. It was developed between 1947–1956 by a team directed by A. A.M. Durrant and Colin Curtis, with vehicle styling by Douglas Scott and designed primarily to be used in London, with its narrow twisty streets. Compared with previous buses it was an innovative design, using lightweight aluminium benefiting from construction techniques developed for aircraft production during World War 2. Other innovations included independent front suspension, power steering, a fully automatic gearbox and power-hydraulic braking. But for all that, it is a product that is used to deliver a service and it is the attributes of the service delivery which should of the basis of the product features for it is these that will deliver the benefits that passengers will enjoy using, and none of those technical innovations are the key feature of the Routemaster or explain why this product has become the icon that it is. As a child I remember well the introduction of the single-crew bus, or the “Jumbo” as it was then known, the ones with the frontal overhang and slidey-shut doors. I recall with clarity Peter Purves on Blue Peter interviewing a driver about this overhang, the driver shrugged and said “you get used to it”. Of course the overhang was there to increase the seating capacity of the vehicle and the slidey doors were there partly for health and safety but also to make sure that you didn’t get on and off without paying. But this was a retrograde step in terms of bus design from the perspective of service delivery. Migrating to a single crew, where the driver also acts as the fare collector, may have saved operating costs but I don’t believe it made for an efficient or convenient service and what’s more I believe this design contributes significantly to traffic delays as the driver has to handle all the fare payments before the bus can move off. Indeed I would argue that the designers of this type of bus did not design the product from the point of view of the service consumer, but rather from the point of view of the service operator. Let’s revisit the definition of a service: A service is an intangible good, the benefits of which are consumed at least in part with simultaneous production of the good. Public transport has to be as easy to use as possible with as few literal and metaphorical barriers as possible as well. 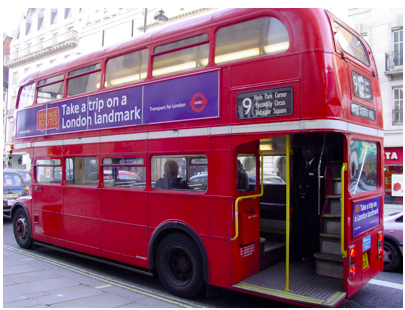 With the Routemaster’s open platform at the rear, passengers simply embarked (or disembarked) and the bus departed, spending less time stationary at the side of the road, because the conductor collected the fares and the driver drove. This meant rounds were travelled more quickly and roads would be blocked for less time by the stationary bus, allowing to traffic flow and thus improving safety. Also it was possible to board, or to disembark, on a less formal basis, such as when the bus was stationary at traffic lights. This casual hop-on-and-hop-offableness made the service easier to use, more spontaneous and in my view this encouraged bus use which today can’t be a bad thing. This simple open platform was the key feature of the Routemaster and this, combined with the excellence of the engineering, was what placed the Routemaster into the hearts of us all. The convenience of this platform and the longevity of use, outlasting it’s newer rival the Jumbo Bus, ensured that when the Routemaster was eventually and officially withdrawn from active service, it had a great send off. The new Routemaster, already dubbed “Boris’ Bus”, is also designed for London and is set to become another London icon, so much so that the design is being protected. Like the original Routemaster this is a step change in bus design and includes many new design ideas, technologies and a new fuel source. But best of all it reintroduces the feature that never should have gone away and which would not have disappeared had bus designers really understood what a service is and how a bus service is used.